What are the plants at church & can I grow them? Often people will ask regarding the landscaping at our church, “What kind of plant is that?” and “Can I grow that?” The following is a list of the most common plants at our church. They have worked great year after year. Though blistering summers, drought, below freezing weather and hungry deer populations they never fail to grow, flower, stay beautiful and attract wildlife. And yes, you can grow them! 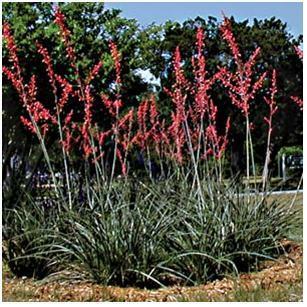 Benefits: drought tolerant (can live off central TX rainfall –as little as 10 inches a year) attracts humming birds, deer resistant, nice flowers spring-summer Needs little to no fertilizer, survives our winters. 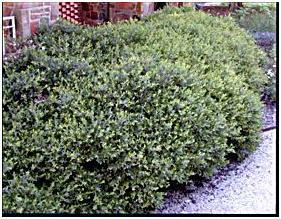 Evergreen Can find at all garden stores, Home Depot, Lowes, etc. 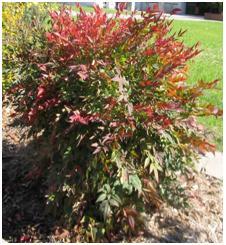 Mature Size & Habit: 4’x4’ give that much room for each plant. Loves full sun can tolerate partial shade. Spacing – if you put them together you can choose to put them 4’ apart. Or 5’ would give 1’ between each one. They look good alone or massed two or more together. Care & Maintenance: Very little -just break off or cut old flower stalks in winter. 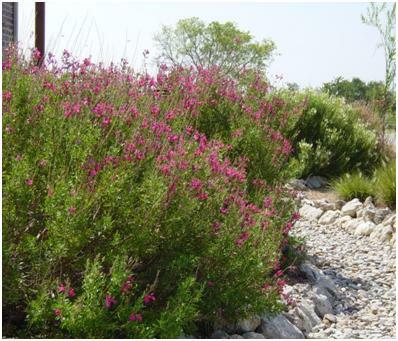 Benefits: drought tolerant (can live off central TX rainfall) attracts humming birds & butterflies deer resistant, flowers –early in spring to late in fall. Needs little to no fertilizer. Almost Evergreen -survives our winters. Can find at all garden stores, Home Depot, Lowes, etc. Many flower types: red, pink, purple, white, coral, and raspberry. 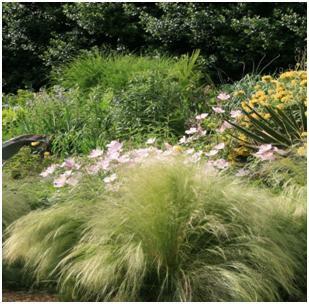 Mature Size & Habit: 3’x3’ give that much room for each plant. Loves full sun can tolerate partial shade. Spacing – if you put them together you can choose to put them 3’ apart. Or 4’ would give 1’ between each one. They look good alone or better massed two or more together. 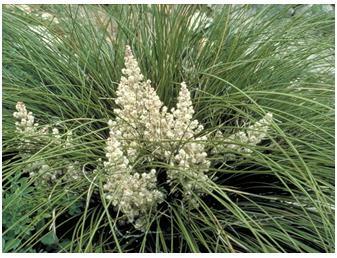 Care & Maintenance: Little – just cut back (by 1/3) in the winter to help the plant stay compact and have greater flowering. 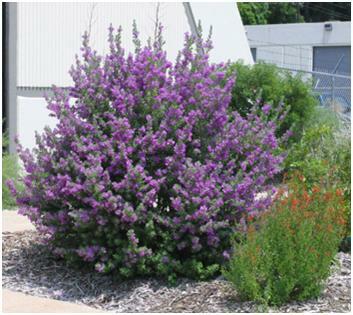 Benefits: extremely drought tolerant (can live off central TX rainfall – even as low as 8 inches a year) attracts humming birds, butterflies, deer resistant, nice flowers purple especially after a rain. Evergreen Needs little to no fertilizer. Survives our winters. Can find at all garden stores, Home Depot, Lowes, etc. Mature Size & Habit: 2 main types *read the label. Spacing – if you put them together you can choose to put them 6’ or 8’ apart. Or 5’ would give 1’ between each one. They look good alone or massed two or more together. Care & Maintenance: very little – just trim back if you want them to be more compact. Benefits: Both are great but not easy to find. They are evergreen, drought and deer tolerant. They have very interesting foliage and flowering stalks in the spring. Little to no fertilizer. Spacing – I think they look best alone but it’s not uncommon for two or more together. 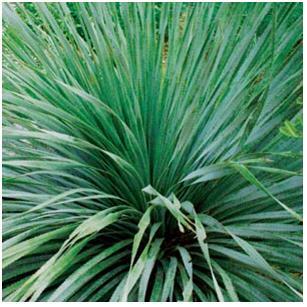 Care & Maintenance: very little – just trim back flower stalks in winter. 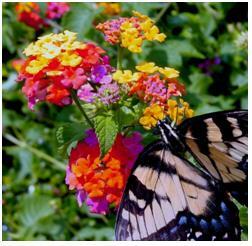 Benefits: drought tolerant (can live off central TX rainfall) attracts humming birds & butterflies deer resistant, flowers –summer to late in fall. Needs little to no fertilizer. Deciduous-freezes to ground -survives our winters. Can find at all garden stores, Home Depot, Lowes, etc. 3’x3’ for red and orange & 4’x4’pink varieties upright, spreading up to 4-5’ for yellow, purple and white. Give that much room for each plant. Loves full sun can tolerate partial shade. Spacing – if you put them together you can choose to put them 3’ apart. Or 4’ would give 1’ between each one. They look good alone. I wouldn’t put too many together or in winter when they are dormant, it will look like a big blank spot. 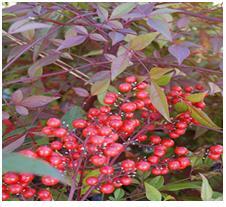 Care & Maintenance: Little – just cut back the dead stems in the winter. Benefits: drought tolerant (can live off central TX rainfall –best to water at first to get established) attracts bees, when flowering, and birds when it has berries in the fall. Deer resistant, nice berries. Evergreen Needs little to no fertilizer. Survives our winters. Can find at all garden stores, Home Depot, Lowes, etc. Also there is a miniature version or dwarf version. 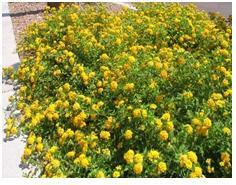 3-4’ x 3-4’ Can survive our rainfall once established, needs water about once a week during the summer to get established. Can take full sun or total shade Looks best massed together. 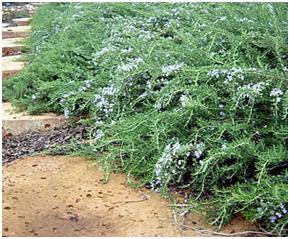 Benefits: drought tolerant (can live off central TX rainfall) deer resistant, Needs little to no fertilizer. Almost Evergreen or year round interest-survives our winters. Can find at all garden stores, Home Depot, Lowes, etc. Care & Maintenance: Very little – can cut back or leave alone. Mature Size & Habit: 4’ wide x5 tall’ give that much room for each plant. Loves full sun can tolerate partial shade. Spacing – if you put them together you can choose to put them 4’ apart. Or 5’ would give 1’ between each one. They look good alone or massed two or more together. Care & Maintenance: Little – cut back in winter. 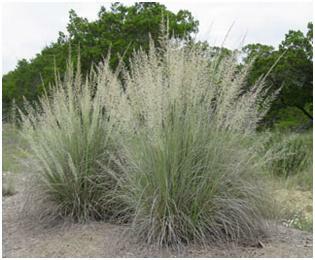 Benefits: drought tolerant (can live off central TX rainfall) deer resistant, Needs little to no fertilizer. Evergreen -survives our winters. Yellow flowers in summer, attracts bees and humming birds. Mature Size & Habit: 4’x4’ but can spread over the years to 6’-6’ give that much room for each plant. Loves full sun can tolerate partial shade. Care & Maintenance: Very little –leave alone. 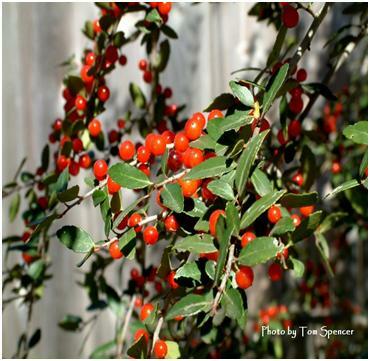 Benefits– all are tough, evergreen, interesting foliage and turn red in the winter (a very nice effect when everything is brown) Can survive in our Texas climate with our natural rainfall. Water to get established the first year. Not as deer resistant and the other plants listed here. Not a humming bird or major butterfly attractor but its winter foliage makes up for that. 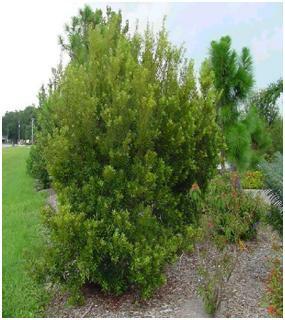 Mature Size & Habit: *Read labels – some are dwarf (2’-3’ x 2’-3’) some are medium sized 4’x4’. Some are large 4’x8’ tall. Large varieties have berries. Can find at all garden stores, Home Depot, Lowes, etc. Spacing: I prefer them massed together, especially the dwarf varieties in rows. Care & Maintenance: Very little –leave alone. If needed cut them back to the ground, they do not like to be trimmed or sheared. 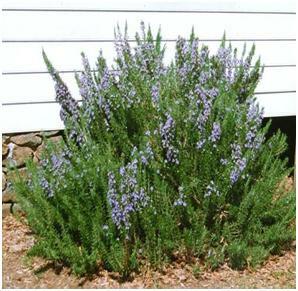 Benefits: evergreen, fragrant and stunning purple flowers in spring. drought tolerant (can live off central TX rainfall) but water to get established. deer resistant, Needs little to no fertilizer. Evergreen -survives our winters. Can find at all garden stores, Home Depot, Lowes, etc. 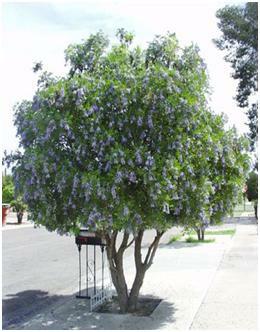 *Be aware TX Mountain Laurel grows very slowly and its red seeds are poisonous if ingested. Care & Maintenance: Very little – can leave alone. Benefits: Evergreen and fragrant. 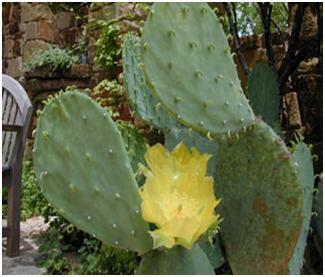 Tolerant of our climate (can live off central TX rainfall in a good year – be sure to water in drought conditions.) Water to get established Deer resistant, Needs little fertilizer. Evergreen –survives our winters. Can find at all garden stores, Home Depot, Lowes, etc. Grows fast. Mature Size & Habit: 15’x15’. Full sun, partial shade or mostly shade. Benefits: Evergreen and fragrant. Tolerant of our climate once established. (can live off central TX rainfall Deer resistant, Needs little fertilizer. Survives most of our winters, can get freeze damage. Can find at all garden stores, Home Depot, Lowes, etc. Grows fast. Blue flowers in spring and fall. Attracts butterflies and bees. Mature Size & Habit: 5’x5’. Full sun or partial shade (upright) Trailing says it can get up to 2’x 8’ I have found it to be around 1.5’ tall x 5’ wide. Care & Maintenance: –Moderate – can leave alone but I have found it grows floppy (upright varieties) its best to keep trimmed. I find the upright to be more sun and drought tolerant than the trialing variety.